Mammals are a special group in the animal kingdom - so can we define an animal.? An animal is ...a Multi cellular organism, made of many cells - It is Heterotrophic (which means it feeds on the food Plant and/or animals of others) in its environment. 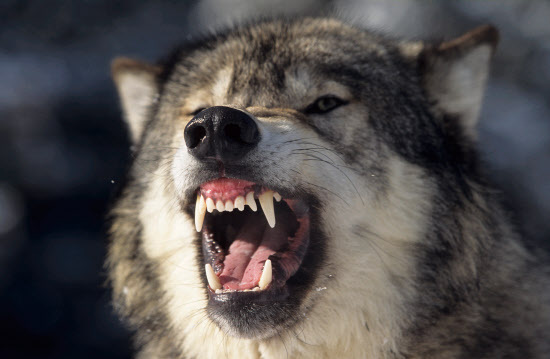 It is capable of moving in response to factors or stimuli in their environment. 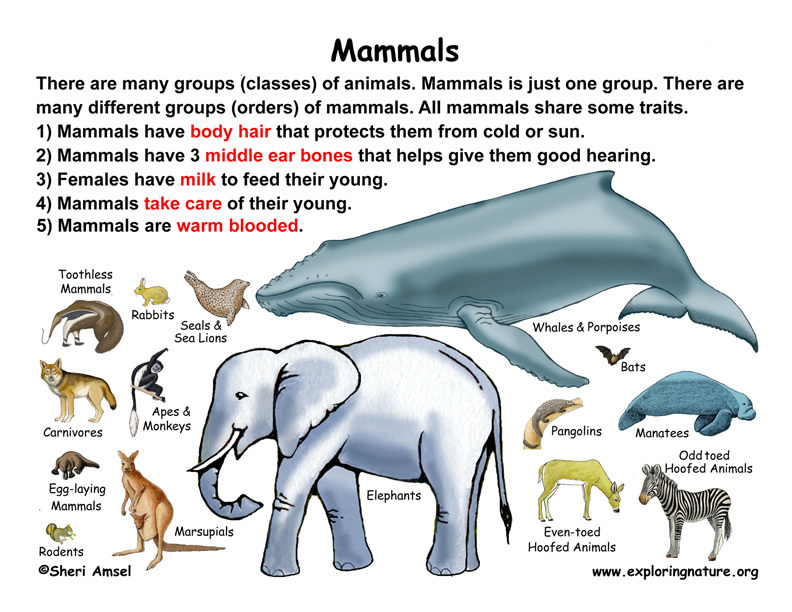 The word Mammal is derived from the scientific name for animals of the class Mammalia and is derived from the latin "mamma" meaning "teat"
Mammals need to consume food in order to carry out the 7 major Life Processes. 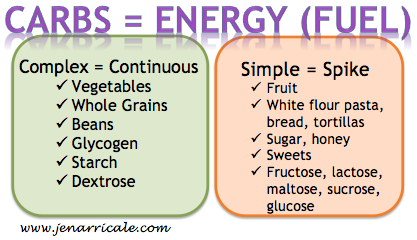 These include sugars and starches and give us ENERGY ! 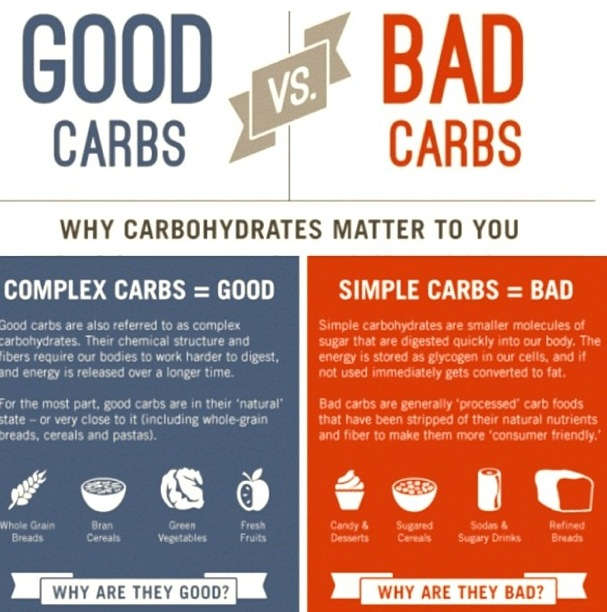 Most carbohydrates in a mammals diet comes from plants and in the form of sugars. 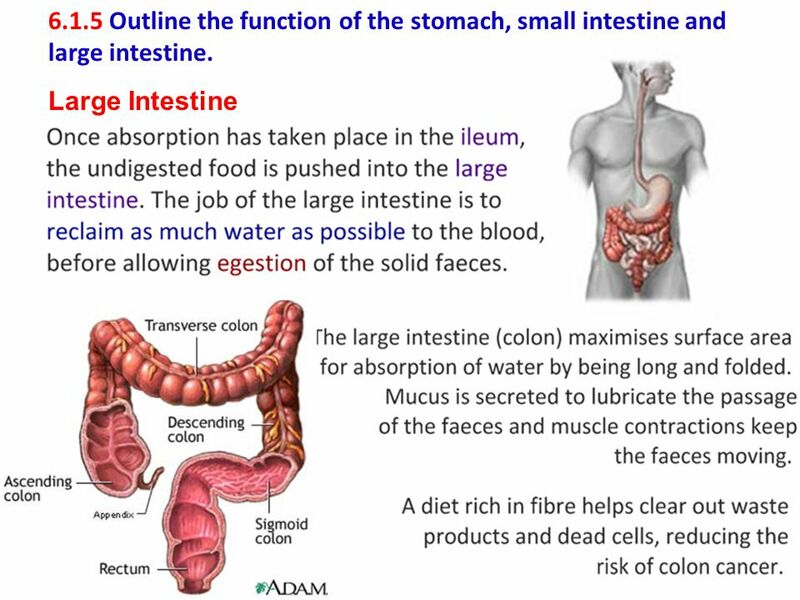 Fibre is also a "carbohydrate" and is found mostly in fruit, vegetables and some cereals (grains) Fibre is the indigestible part and is responsible for moving food through the intestine. 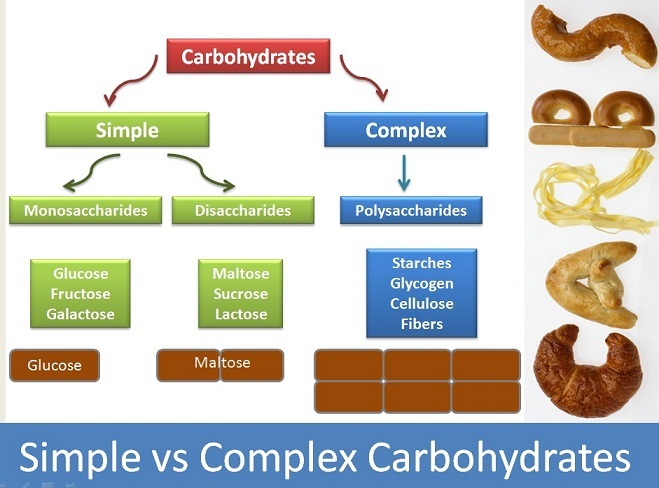 Starch (complex sugars) and Fibre are sugar polymers = hundreds of sugar molecules joined together. Cellulose is the most common form of fibre on the planet. It is a major component of plant cells (the cell wall is mainly cellulose). 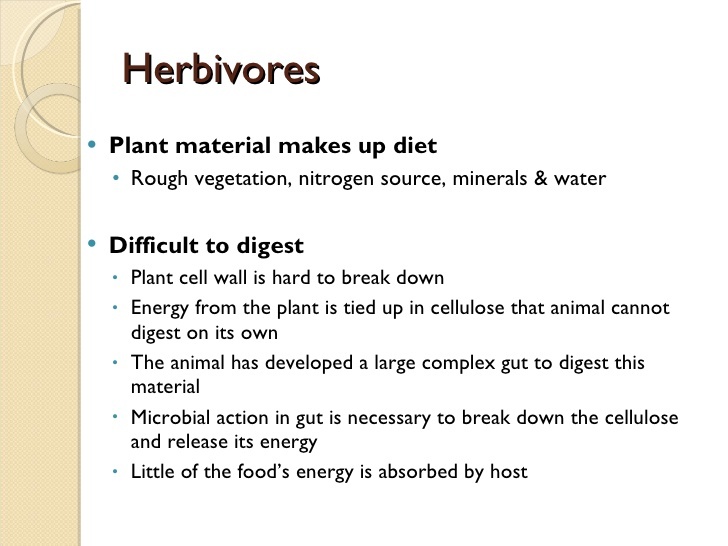 Many herbivores rely on cellulose as a food source even though no mammals can digest it. 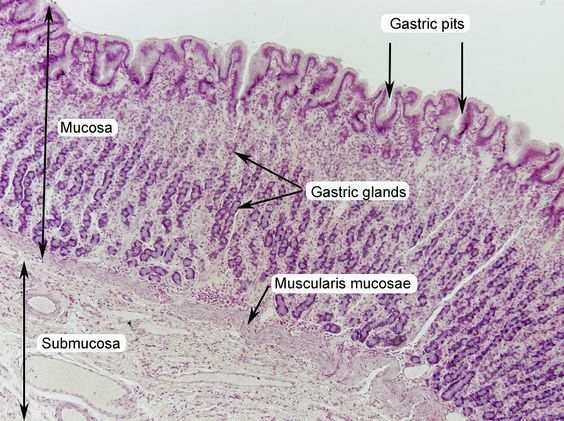 They rely on bacteria in the gut to help break down (digest) the cellulose for them. 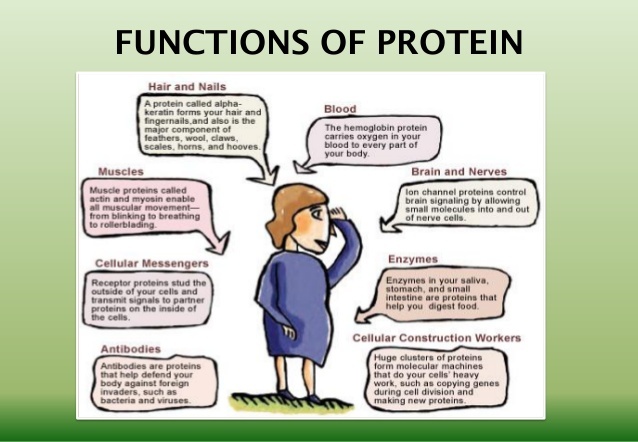 Protein is a source of energy but its main role in the body is growth and repair. It helps in the formation of muscles, hair, nails, skin and organs, such as the heart, kidneys and liver. We all contain a significant amount of protein. For example, a 76kg man is made up of 12kg of protein (16%). 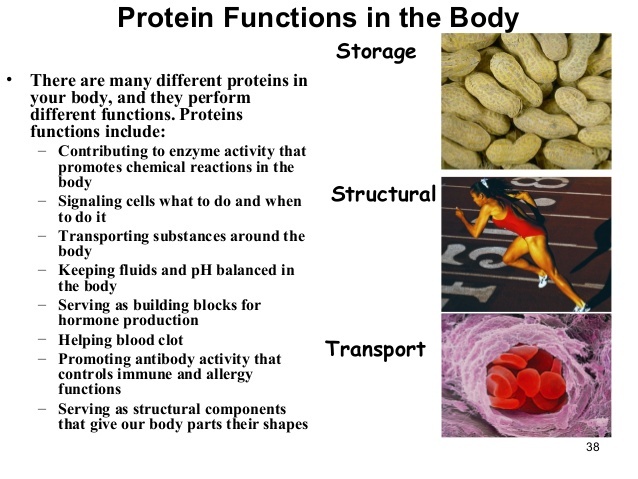 Protein can be found in all cells of the body and is the major structural component of all cells in the body, especially muscle. This also includes body organs, hair and skin. 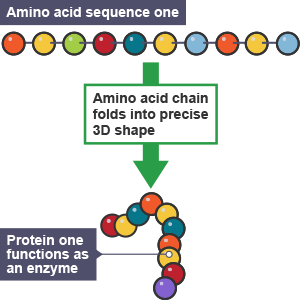 Proteins are also used in membranes. Click here to learn more about Protein !! Lips are more commonly known as fats, play many important roles in your body, from providing energy to cell membrane development and producing hormones. 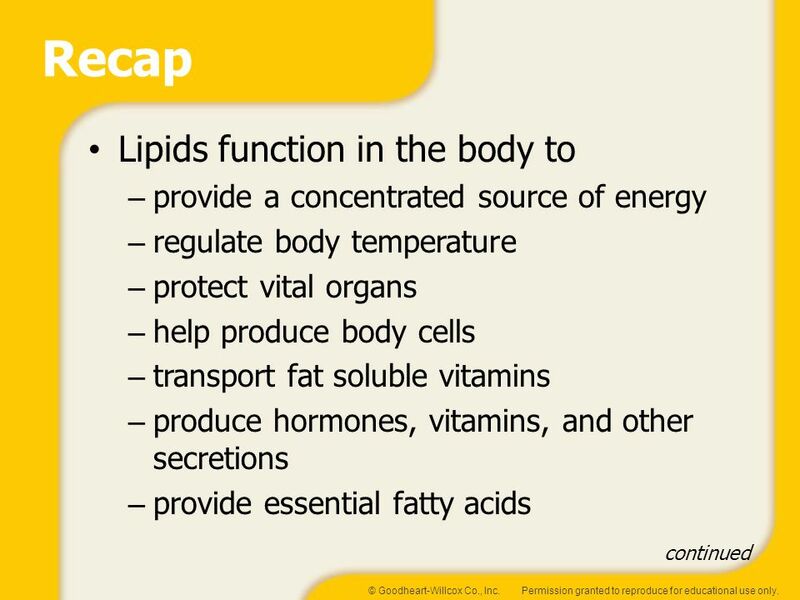 You wouldn't be able to digest and absorb food properly without lipids. Of course, eating more fat than you need can lead to weight gain, but in proper amounts lipids are a healthy part of your diet. 1. TriglyceridesTriglyceride molecules are made from three molecules of fatty acids and one glycerol molecule. The fat can be either unsaturated or saturated. Triglycerides are able to float in a cell’s cytoplasm since they have a lower density than water and are non-soluble, as is the case with all lipids. A triglyceride will be classified as a fat if it becomes solid at a temperature of 20ºC, otherwise that are classified as oils. 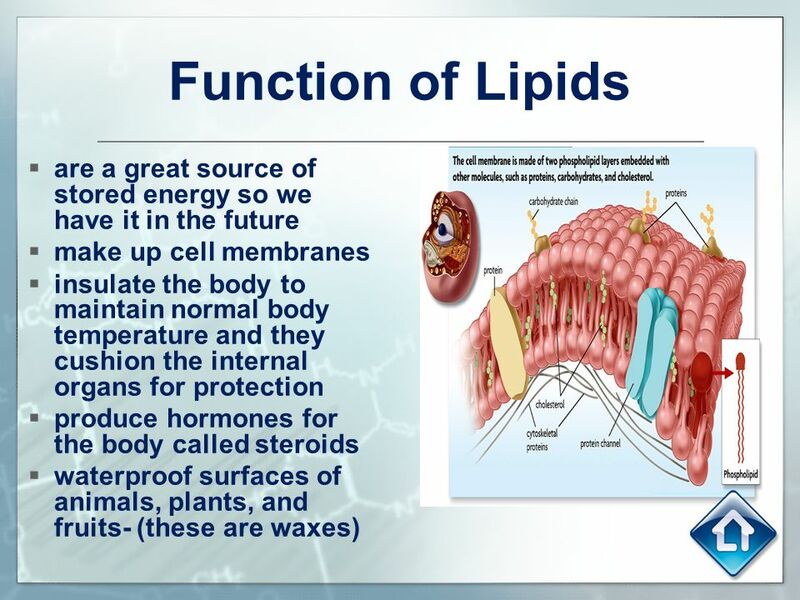 Triglycerides are crucial in the body for energy storage. 2. SteroidsSteroids have a structure that resembled four rings fused together which are made from carbon molecules. A few types of common steroids are cholesterol, testosterone, vitamin D2 and estrogen. Steroids benefit the body by helping determine and control the structure of plasma membrane. 3. PhospholipidsPhospholipids earn their name as their constitution is primarily phosphate groups. They contain molecules that both attract and repel water, playing a key role in constituting cell membranes. 4. 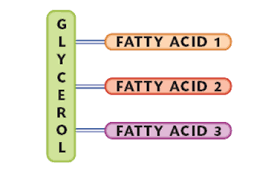 GlycolipidsShort sugar chains form glycolipids, which can be found in a cellular membrane’s exoplasmic surface. They play an important role in boosting the body’s immune system. 5. LipoproteinsA lipoprotein is a combination of proteins and lipids found in a cell’s membrane – examples being antigens and enzymes. Lipoprotein help fat move around the body in the bloodstream and exist in the form of Low Density Lipoprotein (HDL) and High Density Lipoprotein (LDL). 6. WaxesAlong with a chain of alcohols, fatty acids are found in waxes. These are extremely common lipids and can be found on animal feathers, in human ears and even on the leaves of plants. Their primary function is one of protection. Occurs in EVERY living cell. It is defined - as the breaking up of Glucose in the presence of oxygen to release Energy in the form of ATP along with CO2 and H2O. It is controlled by ENZYMES every step of the way. 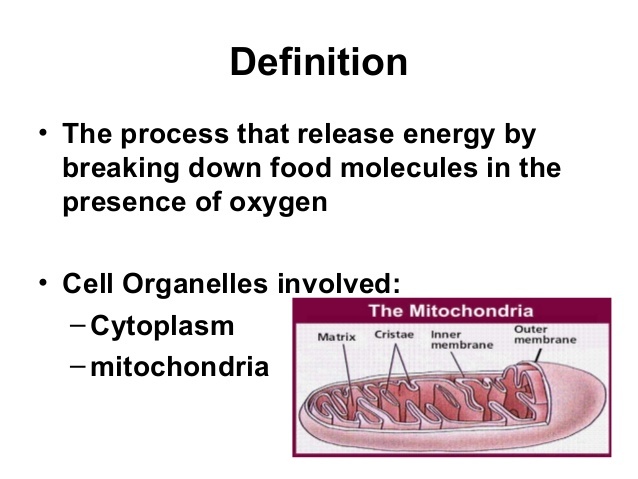 This cellular process occurs in the organelles called Mitochondria. Our circulatory system is how the Glucose (from digestion) and Oxygen (from gas exchange on the lungs) is transported to EVERY CELL in our body so they can respire - carry our cellular respiration!! Mammals that eat grass are called Herbivores, those that eat meat are called Carnivores and those that eat both are termed Omnivores. Herbivore, Carnivore and Omnivore are reffered to as a mammals "trophic group" which comes from the Greek term trophikos meaning "nutrition". 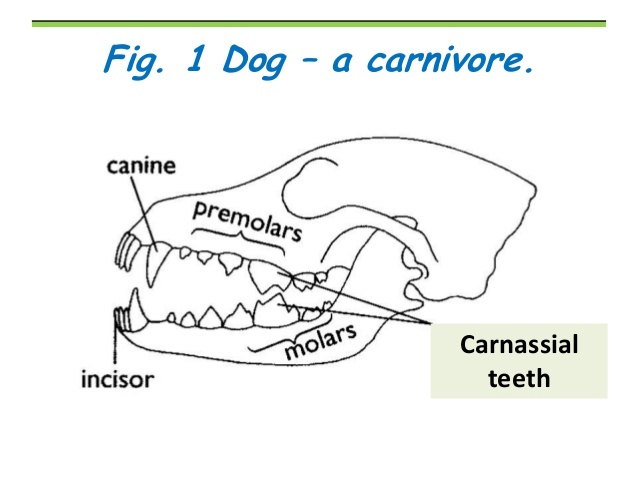 Teeth play an important part of Ingestion = taking food into the mouth. 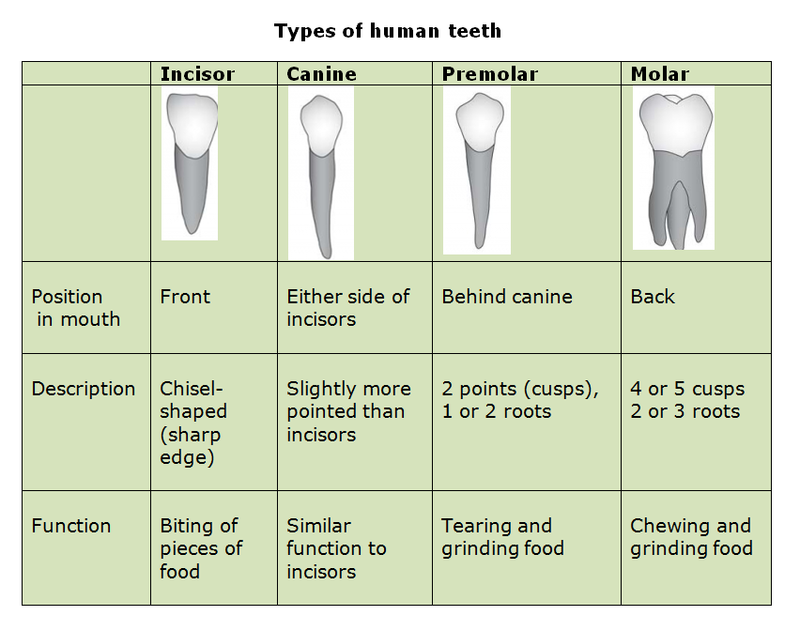 Teeth have 3 main roles- they are used to capture and subdue living prey, remove food from its source AND to increase the surface area of a food so that digestive enzymes and gastric chemicals can work more efficiently and effectively. 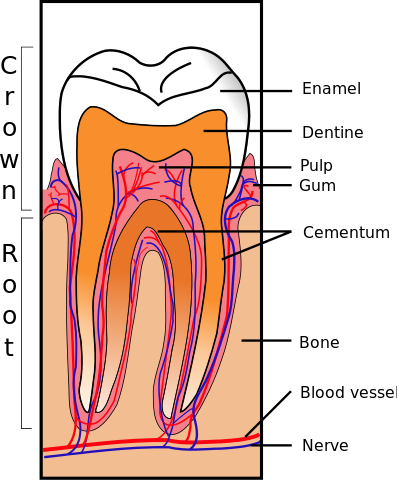 The structure of each tooth type is directly related to its role. 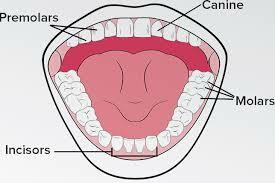 Digestion.....Starts in the mouth - with the teeth and Saliva. 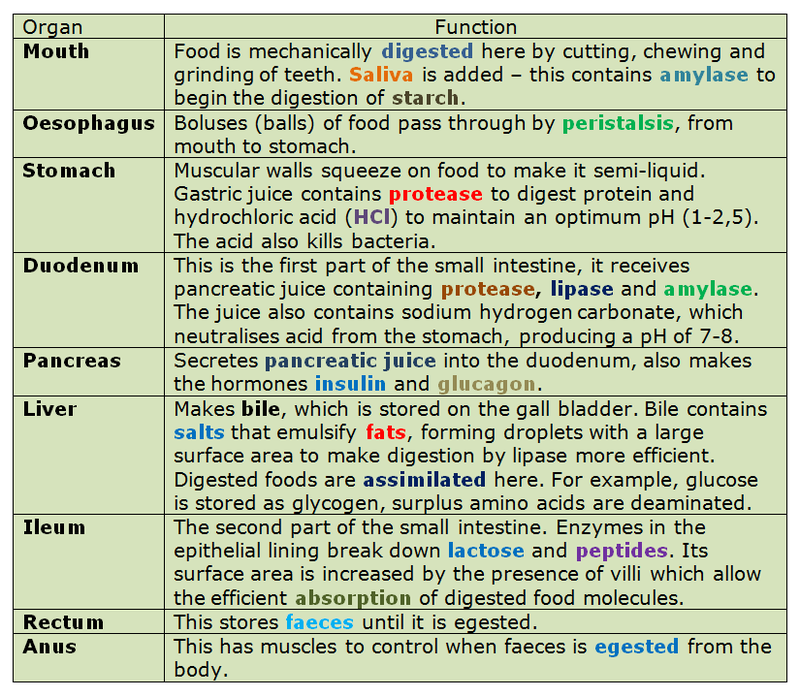 Ingestion is the termed used for taking food into the mouth. Saliva – produced by the salivary glands – lubricates the food-Contains AMYLASE = starch digestion and MUCIN - the slimy substance. 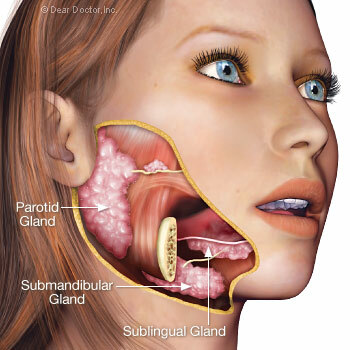 Saliva -Produced in salivary glands, saliva is 98% water, but it contains many important substances, including electrolytes, mucus, antibacterial compounds and various enzymes. 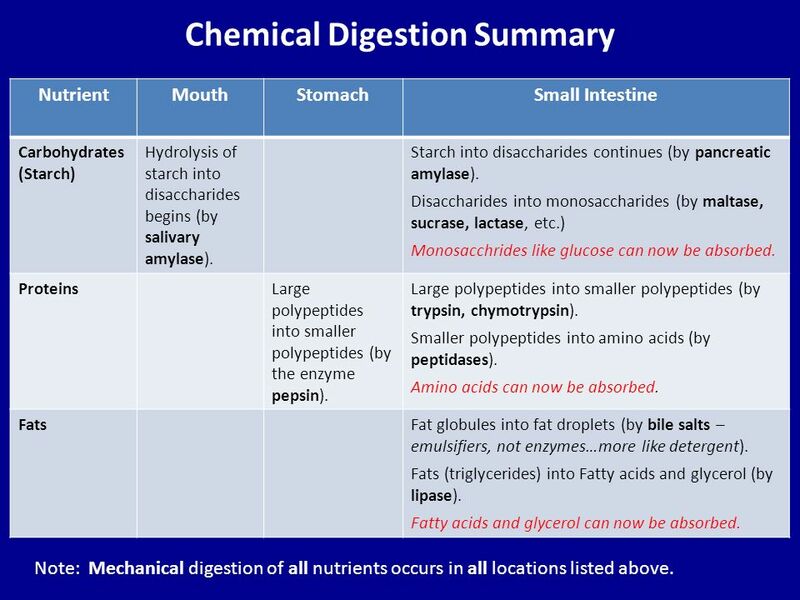 The saliva and the digestive enzymes is termed a from of Chemical digestion. The other digestive functions of saliva include moistening food, and helping to create a food bolus, so it can be swallowed easily. 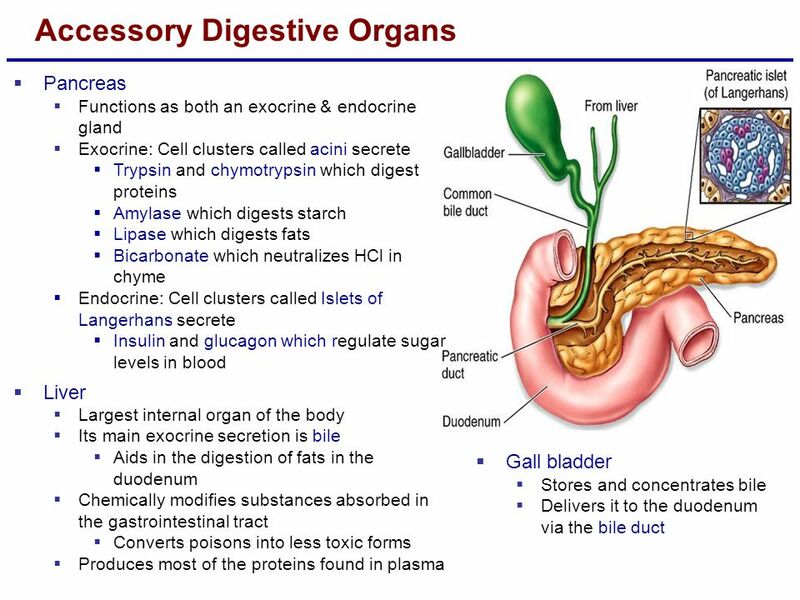 Store and gradually release food into the duodenum. *Pyloric Sphincter relaxes to let chyme enter the doudenum. 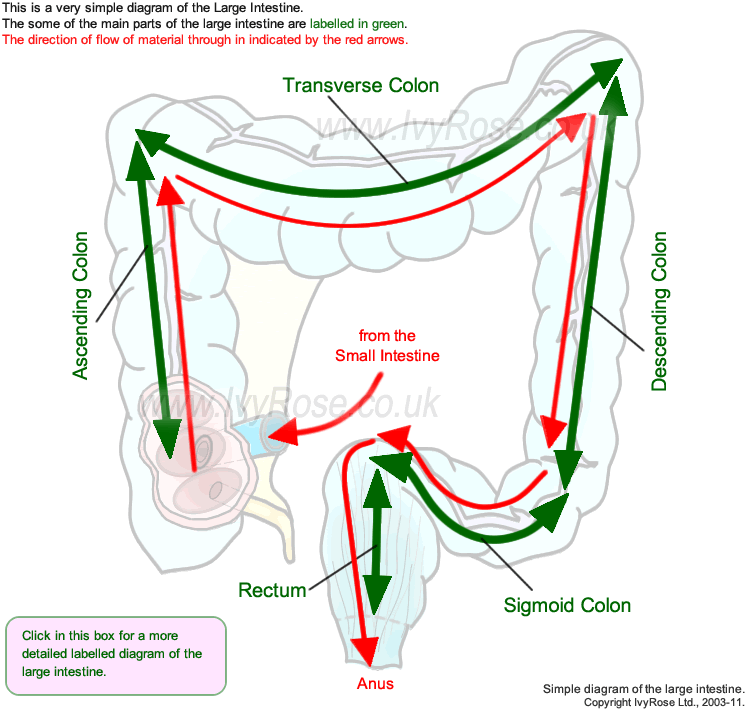 The duodenum is the first and shortest segment of the small intestine. 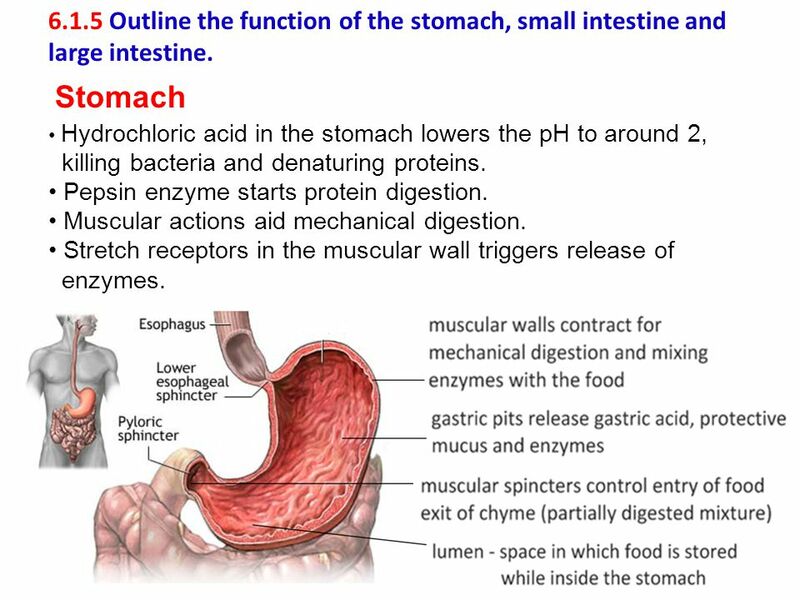 It receives partially digested food (known as chyme) from the stomach and plays a vital role in the chemical digestion of chyme in preparation for absorption in the small intestine. •Glycogen and Insulin ( a hormone) to regulate sugar levels in the blood. A yellow/green liquid which acts on lipids and is released into food that contains fat in the Duodenum. •To emulsify the Lipids to increase the surface area for the action of Lipases-increase the rate of lipase action. •Assimilation - Is the process in which products of digestion (ie: nutrients) are incorporated into and become part of the body cells and tissues. 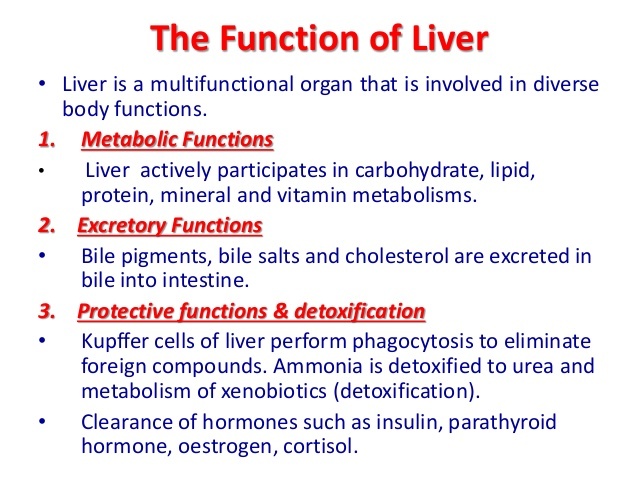 •The Liver receives nearly all the food absorbed into the bloodstream - so it participates in the breakdown of Carbohydrates, Proteins, Lipids. 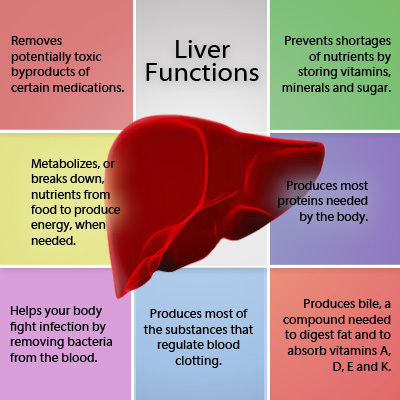 •The Liver acts as the "sorting house" and ensures consistent delivery of nutrients to the blood- so it CONTROLS the amounts distributed to the cells depending on the bodies needs. •It stores, sorts, re-directs, regulates or breaks down further the nutrients it receives. 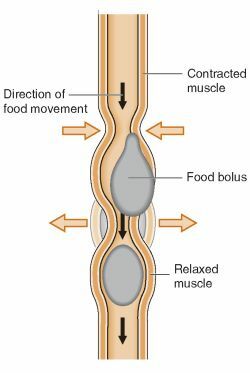 •Is the site of absorption = the taking in (absorbing) of digested nutrients (eg: Amino acids and Glucose) into the bloodstream so that cells can utilise them for Respiration and other life processes. Function to greatly increase the surface area available for absorption into the bloodstream and lacteals so increases the RATE of absorption. 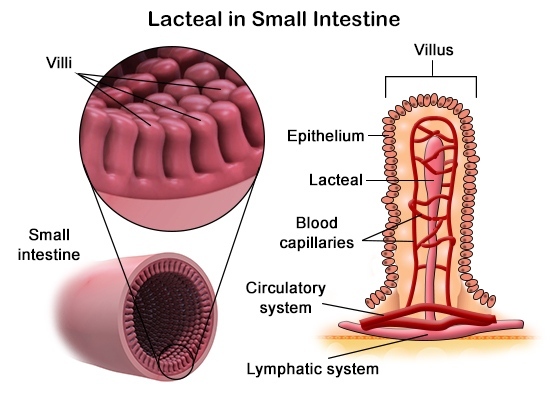 The large intestine takes about 16 hours to finish the digestion of the food. 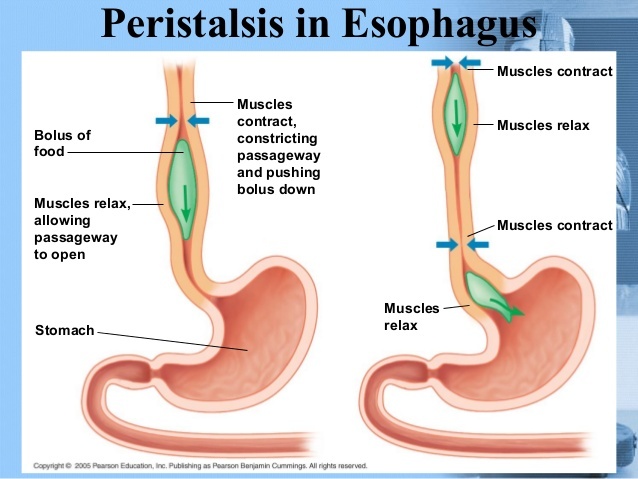 It is surrounded by a ring of muscle – Peristalsis ensures food is moved through at speed to maximise H2O absorption & also prevent it getting stuck !! Food that enters here is largely waste matter which is indigestible such as Cellulose + plant fibres (the roughage) bacteria, mucus and dead cells. Bacteria also breakdown this roughage further = gas = Flatulence !! Cool anatomy website..check it out ! 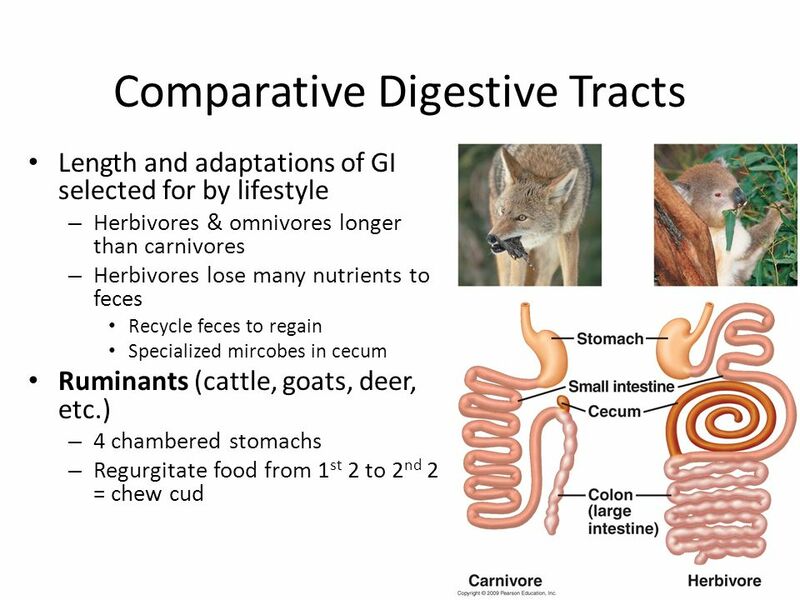 Like us Herbivore's can’t produce Cellulose digesting enzymes BUT instead they have Bacteria that release Cellulose digesting enzymes Cellulase and specialised and often enlarged structures to “house” them - a Caecum and appendix OR a special large 4 chambered gut. 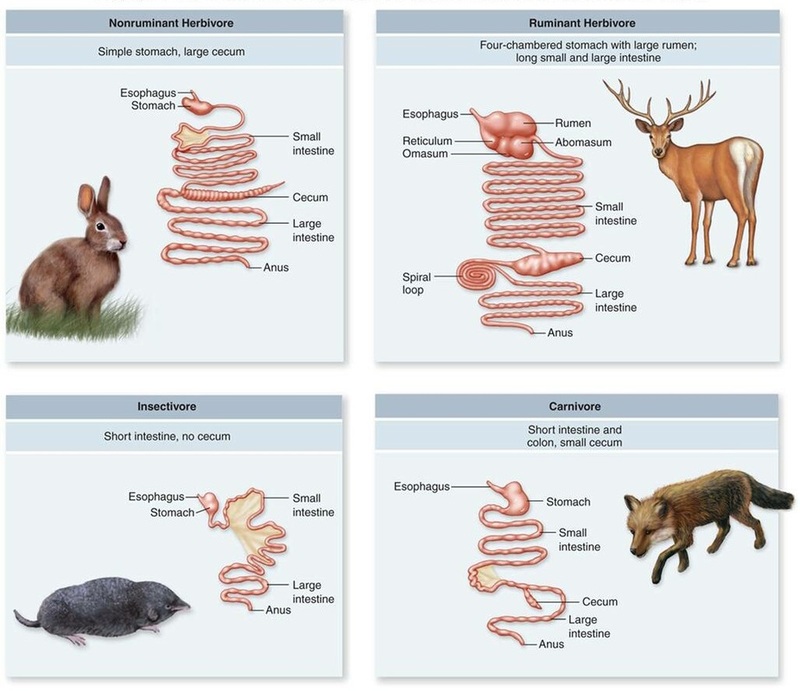 HINDGUT Herbivores - includes all rodents (rats and mice) as well as rabbits is characterised by a Large, well developed CAECUM. Caecum = role in digestion of Cellulose for the Hindgut herbivores = houses the bacteria that breakdown the Cellulose – ie: the billions of bacteria contain the cellulose digesting enzyme Cellulase to convert Cellulose to Glucose and then they respire using the Glucose as energy source – it is a Mutualistic relationship beneficial to the host (herbivore) AND the bacteria - bacteria get to keep warm, safe environment to grow, feed and reproduce. 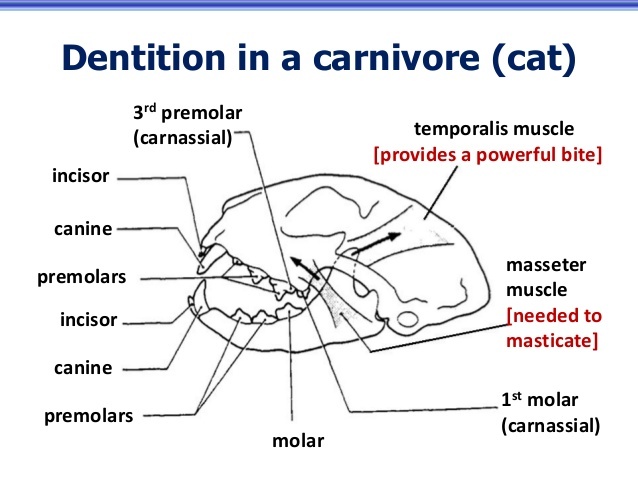 Specialised structures are – relative to size of the organism ie: larger the herbivore the larger the caecum . 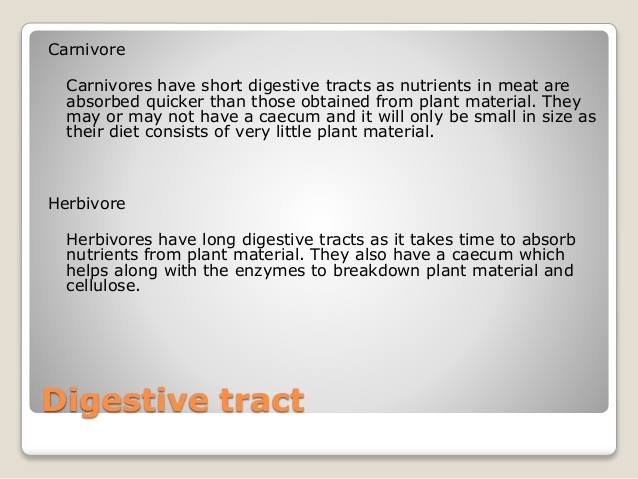 The Stomach is often smaller as it is not so much of a “storage” organ for Herbivores – food needs to get into the Caecum asap for bacteria action. 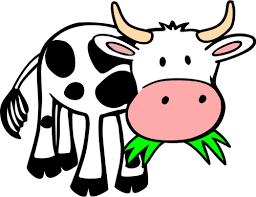 COWS and SHEEP (and goats) are referred to as Foregut Herbivores or Ruminants. 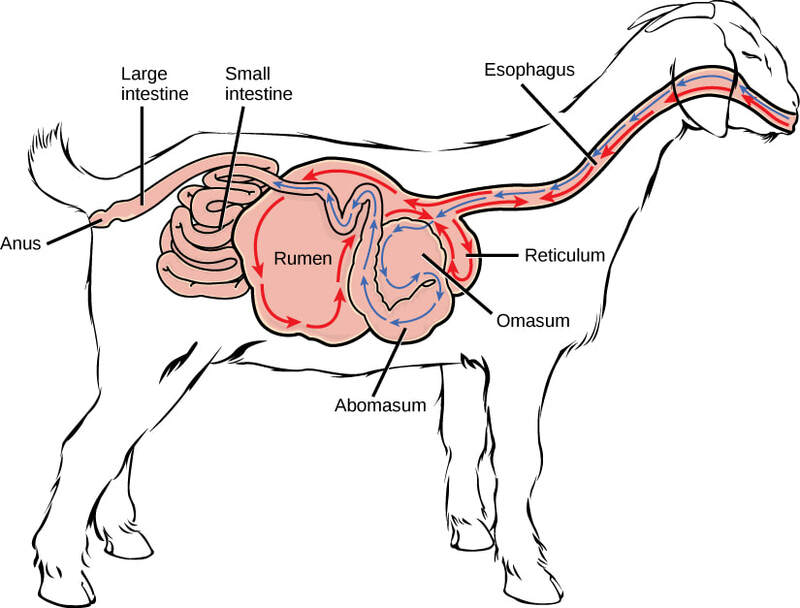 Their digestive system is distinguished by their specialised chambered stomach & chewing of the cud. COWs and SHEEP spend most of their time chewing their cud and ruminating !! 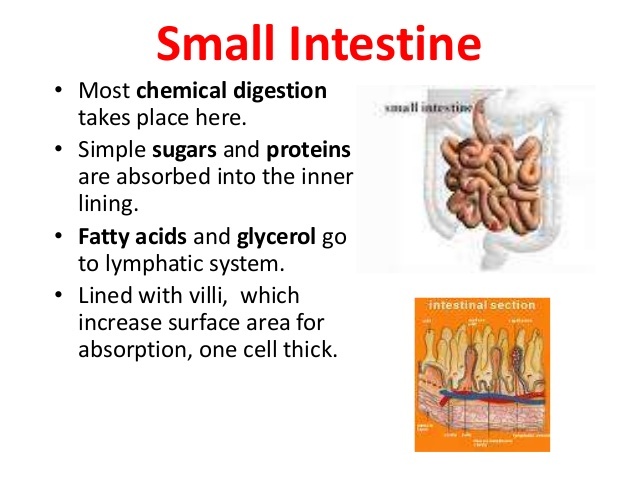 WHY - because this physical digestion is necessary in order to break down the cellulose cell walls so as to make the most of the Enzyme action (chemical digestion) and the assimilation of nutrients into cells. It also increases the production of SALIVA which ensures that the RUMENS environment does not get to acidic so that the billions of Bacteria populations are maintained ! The SHEEPS specialised stomach - the stomach is a very important part of their digestion. 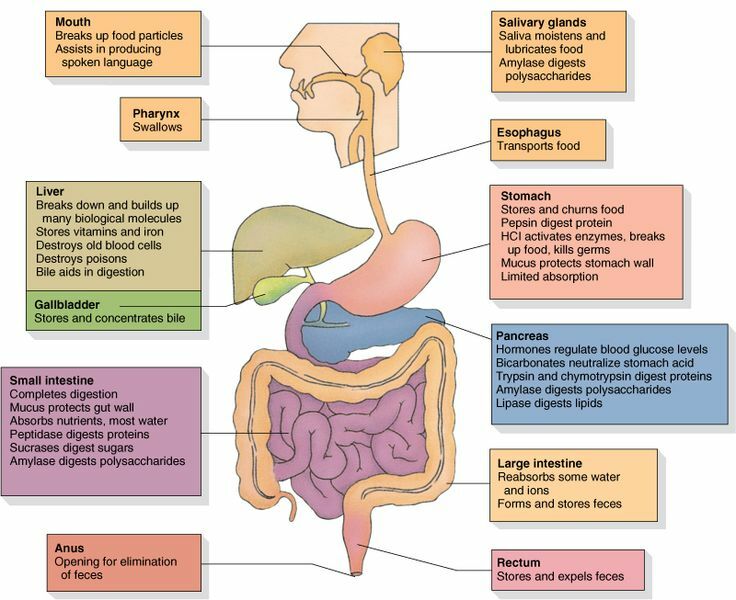 The chemical digestion starts in the stomach and is the result of fermentation and enzymes. 2. 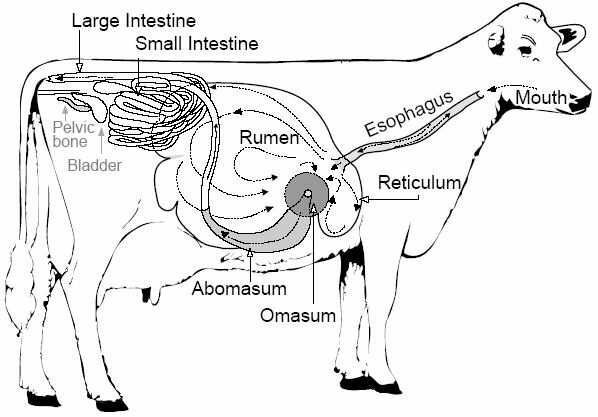 The RUMEN is where bacteria start the digestion of the cellulose by fermentation and the release of cellulase which digests cellulose into glucose.Muscular contractions mix the grass with the billions of cellulose digesting bacteria (pH is 7.3- 5.7) weakly basic and acidic. 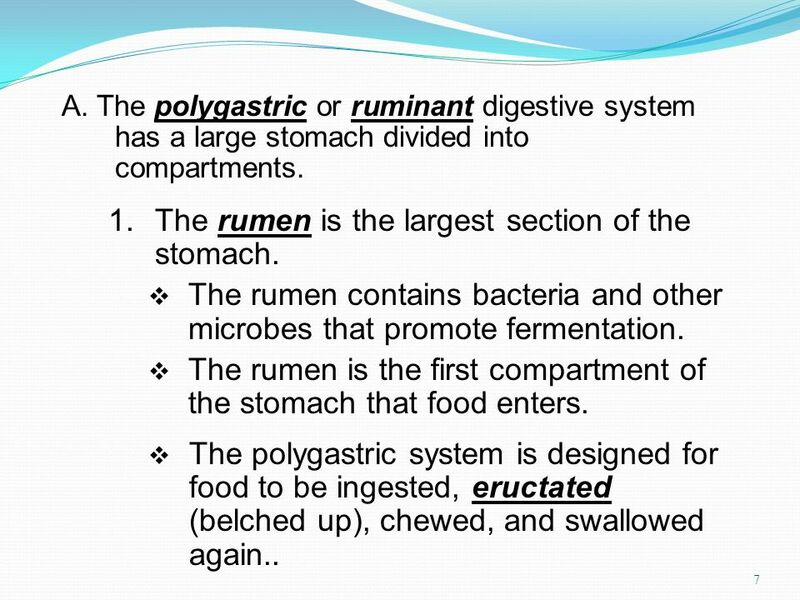 ** ENZYMES -Both ruminants have Pepsin and Pipase involved in chemical digestion. The circulatory system includes the heart, blood vessels and blood, and is vital for fighting diseases and maintaining homeostasis (proper temperature and pH balance). The system's main function is to transport blood, nutrients, gases and hormones to and from the cells throughout the body. It is an organ system that transports material in blood such as food or oxygen to every cell in the body and removes waste such as carbon dioxide. Blood transports various substances from one part of the body to another by continuous flowing through a closed system of blood vessels known as the circulatory system. 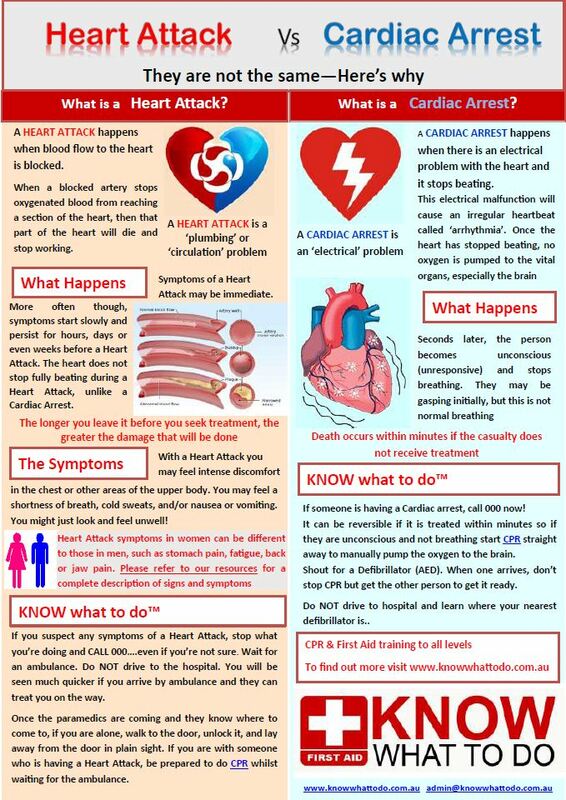 The blood flow is known as blood circulation. Blood is moving by means of an organ known as the heart, which is a muscular pump that draws blood in when it relaxes and pushes it out at great force when it contracts. Did you know we make about 2.4 millions Red Blood cells every second....Blood makes up around 7% of the weight of a human body. 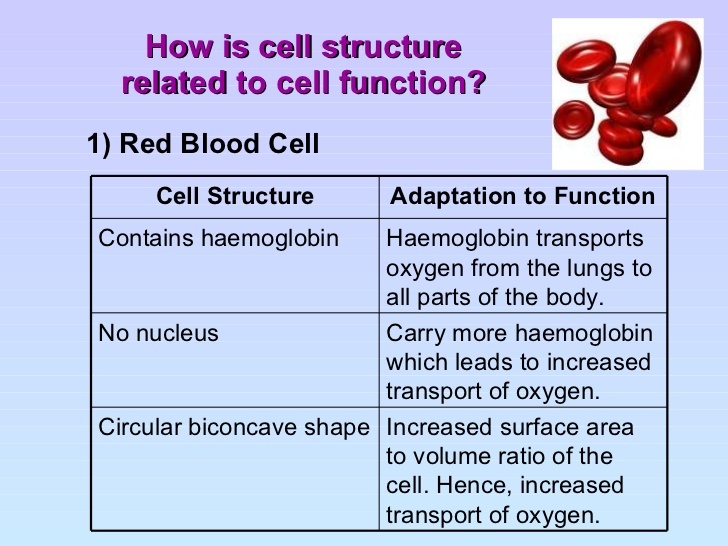 Red blood cells have the important job of carrying oxygen around the body. They also contain a protein called hemoglobin. Hemoglobin contains iron which combines with oxygen to give hemoglobin and our blood, a red color. 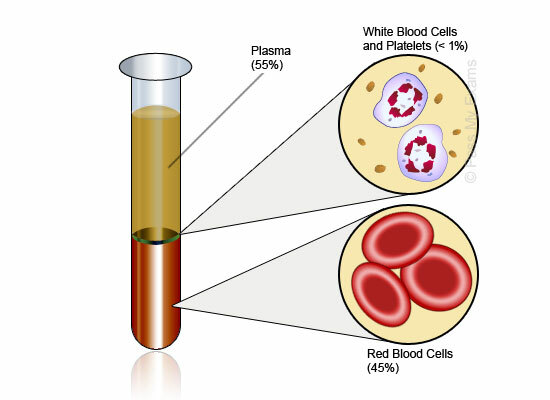 Red blood cells develop in bone marrow and circulate in the body for around 120 days. 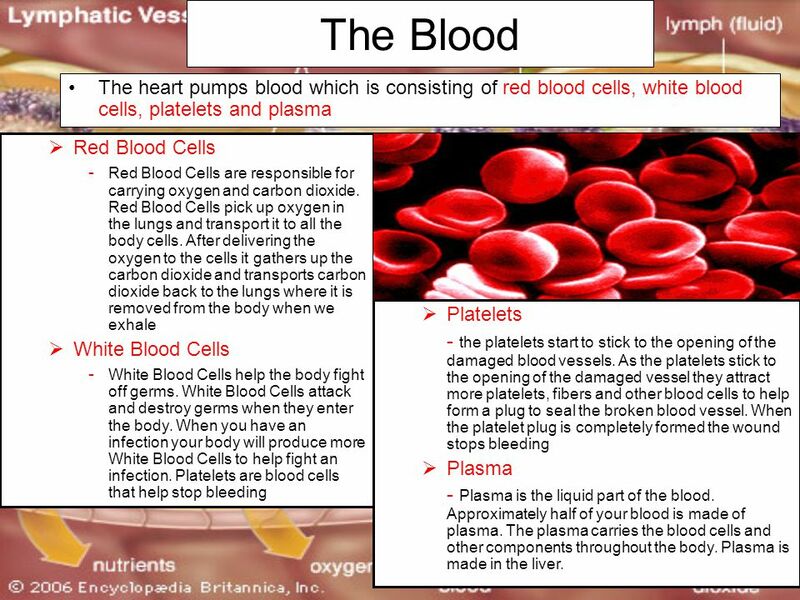 White blood cells are an important part of the body’s immune system. They defend against certain bacteria, viruses, cancer cells, infectious diseases and other unwanted materials. A red blood cell is around 7 microns in size. (A micron is one millionth of a metre). 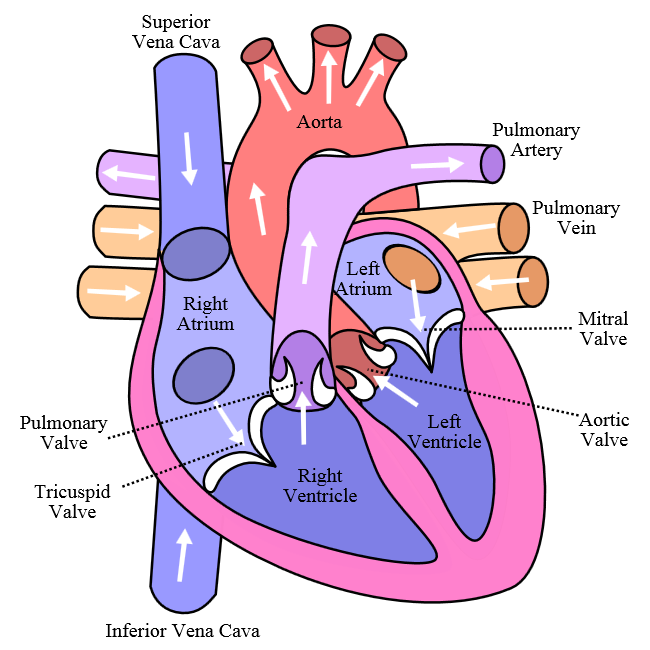 Valves function to prevent blood from flowing backwards. 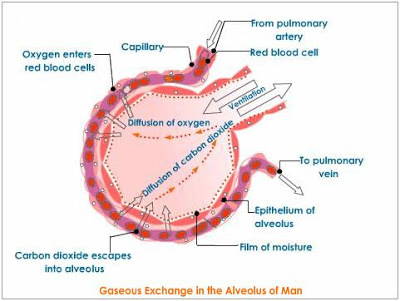 To supply the cells of our body with a continuous supply of oxygen for respiration and to remove the carbon dioxide generated by respiration, we have evolved a specialised exchange surface for gas exchange within the breathing system. 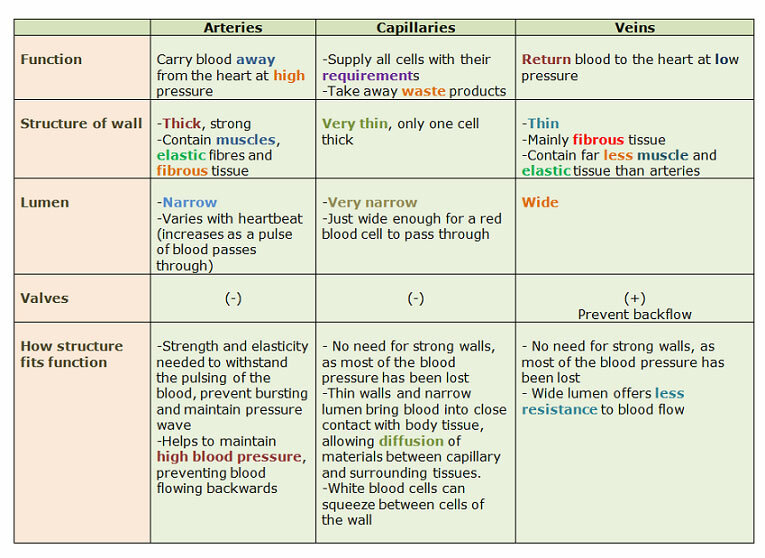 The efficiency of this system is further improved by ventilation of this exchange surface and by having an efficient blood supply - both of which maintain a suitable concentration gradient. 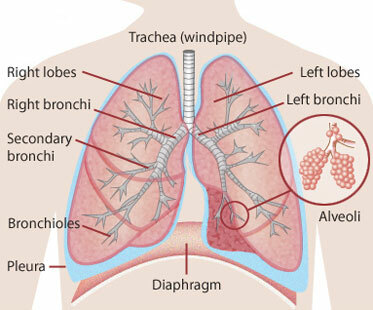 The lungs are located within the upper part of your body called the thorax. 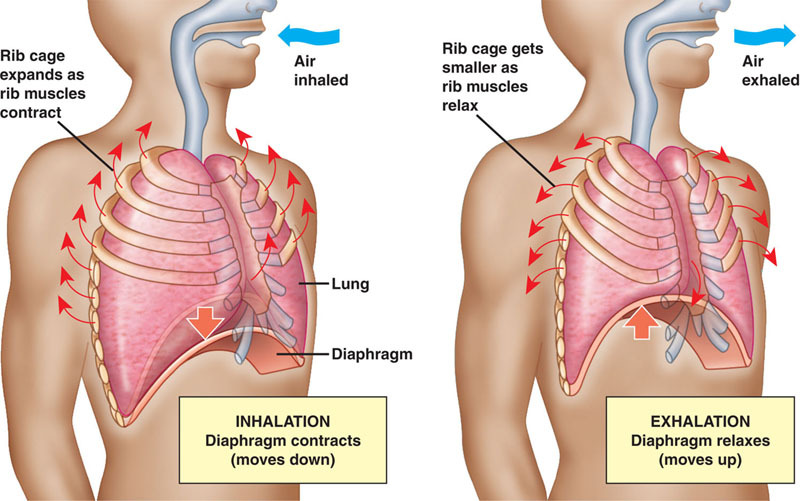 They are surrounded by the ribcage (which protects them) and in between the ribs areintercostal muscles which play a role in ventilating the lungs. Beneath the lungs is a muscular sheet called the diaphragm. 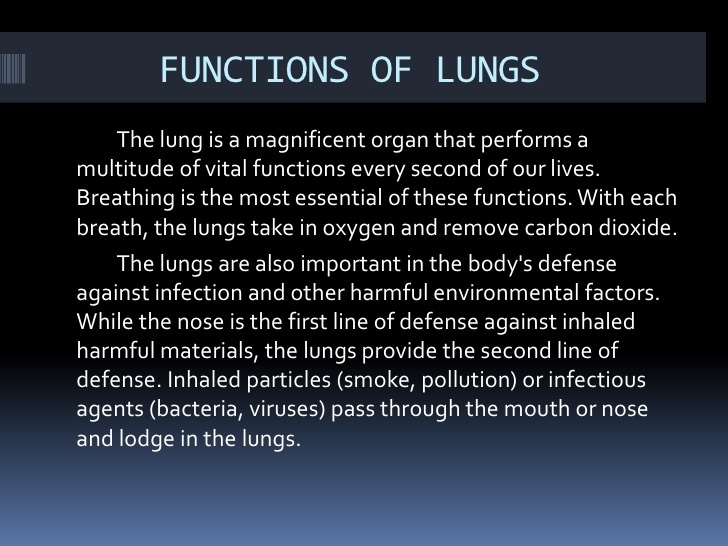 This separates the lungs from the abdomen of the body and also plays a role in ventilating the lungs. Within the lungs is a network of tubes through which air is able to pass. Air is firstly warmed, moistened and filtered as it travels through the mouth and nasal passages. 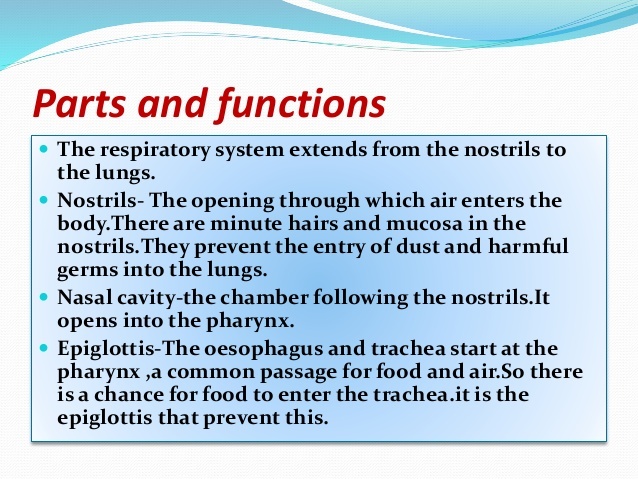 It then passes through the trachea and down one of the two bronchiand into one of the lungs. 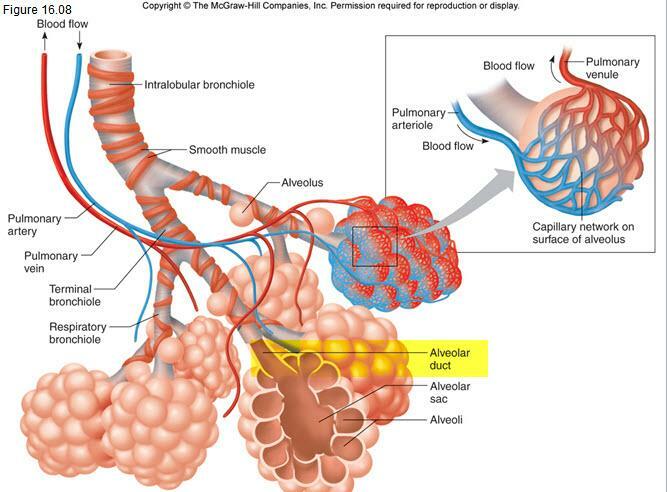 After travelling into the many bronchioles, it finally passes into some of the millions of tiny sacs called alveoli, which have the specialised surfaces for gas exchange. They are folded, providing a much greater surface area for gas exchange to occur. The walls of the alveoli are only one cell thick. This makes the exchange surface very thin - shortening the diffusion distance across which gases have to move. 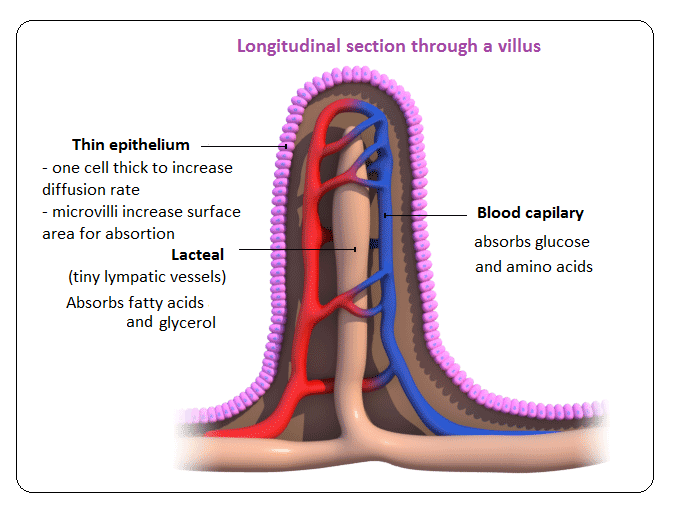 Each alveolus is surrounded by blood capillaries which ensure a good blood supply. 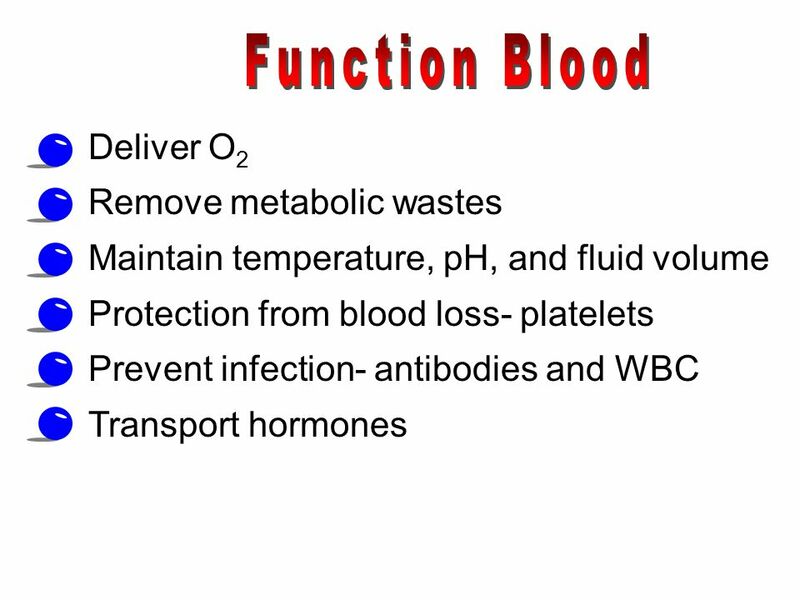 This is important as the blood is constantly taking oxygen away and bringing in more carbon dioxide - which helps to maintain the maximum concentration gradient between the blood and the air in the alveoli. Each alveolus is ventilated, removing waste carbon dioxide and replenishing oxygen levels in the alveolar air. This also helps to maintain the maximum concentration gradient between the blood and the air in the alveoli. The intercostal muscles contract, expanding the ribcage outwards and upwards. The diaphragm contracts, pulling downwards to increase the volume of the chest. Pressure inside the chest is lowered and air is sucked into the lungs. The intercostal muscles relax, the ribcage drops inwards and downwards. The diaphragm relaxes, moving back upwards, decreasing the volume of the chest. Pressure inside the chest increases and air is forced out.